Many, many years ago, Naples was a chaotic swarm of people and different crafts. The city was animated by the baccalaiolo (salted codfish vendor), the cavallaro (horseman), the carter, the franfelliccaro (colored caramel stick seller), the coachman, the ostricaro (oyster seller). And yet the woodworker, the acquaiuolo (water seller), the shoemaker, the groom, the maccaronaro (pasta vendor), the distiller. The list would be endless. Among the countless professions, some quite fanciful and undoubtedly unique, which found place in Europe’s largest city there was also the pizzaiolo, or rather the pizzaiuolo, such as the Neapolitan language demands. With the term coined to describe it, the business itself, done in expressly equipped shops and by skilled staff, in short, as we conceive it these days, appeared only in the beginning of the XIX century. In the past, pizzas were sold in the street, that’s why we talk about street food: sold to the pizza vendors, wrongly called pizzaioli, they were resold to people, shown on special movable stands in the most crowded districts, centers of what, shortly thereafter, became the Kingdom of the Two Sicilies capital. Even though, the job origins go back to ancient time and followed the evolution of humans and their eating habits. Mixing the water with ground cereals and shaping the dough into a flat disc is, in fact, a practice that dates back to old times. Certainly, not like the pizzas we know, they were, rather, focacce cooked on a red hot surface, stone or pan, or under ashes as those in Egypt, at the time of the Pharaohs, which were dressed with herbs. 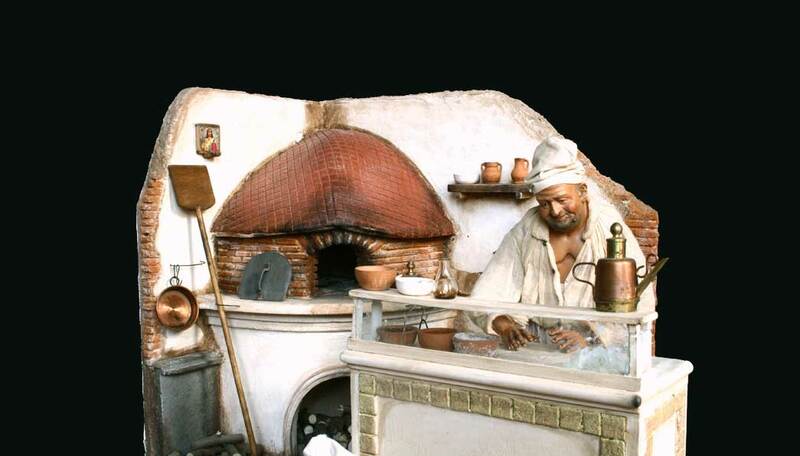 At the lower end of the social scale, the pizzaiuoli, keepers of hundreds years of history, habits and customs, for a long time grouped together with tavern keepers, innkeepers and bakers, in want of a trade association that pretect them, had to work hard before being recognized as a professional category. Lowly regarded, as the stamp duty of only 2 ducats placed on the business license proved, those who made the pizzas waited for the second half of the 1700s to start having an identity and a name, when, too later, it was already time for the arts and crafts corporations to be dismembered and lose their function. Handed down from father to son, this craft – actually, an art – at some point, made a leap forward. While in 1807, there were 68 pizzaiuoli with a shop, mostly located in the historic city center, about sixty years later, that number doubled to bring the pizza in almost all districts of Naples. Breakfast or lunch for the majority of Neapolitans, bought for a coin, poor people food, started to seduce even those who initially snubbed it and head, with its artists, for the contagious fame that still has. But, the real boom as the appreciation of the job and the figure of the pizzaiuolo has occurred only recently. A fundamental change has prompted us to rewrite the hierarchical pyramid which, nowadays, sees the chefs right on top of it. Some of them achieved a place in the haute cuisine next to the great chefs, became an expert connoisseur of flour, doughs and rising, studied and did a lot of researches to work anymore, simply and only because the experience of their predecessors said to do so but because they know and fully understand, even from a scientific point of view, what to do. Their creativity is repeatedly a source of inspiration for other masters as shown, for example, by the latest work of the great Italian photographer Oliviero Toscani. We hope that the whole category evolves.